This week the 2.7.1 update of DoLeague creates a new section, “Report” in the results page and it redesigns too. We have created a page with a more practical design where you can see more clearly the match information. More detailed information on the results, fouls, cards, etc, depending on the type of sport. And you have funny and custom icons in each of the tournaments you organize with DoLeague. Now, we will show you step by step all the advantages that the 2.7.1 update has brought to DoLeague. The old page of results ended with the section “Leave your comment”. Now, there are the section “Report” where you can write down all the match details: goals, fouls, cards, time outs, and even the name of the referee, etc. The design of this new section is clear and functional too. 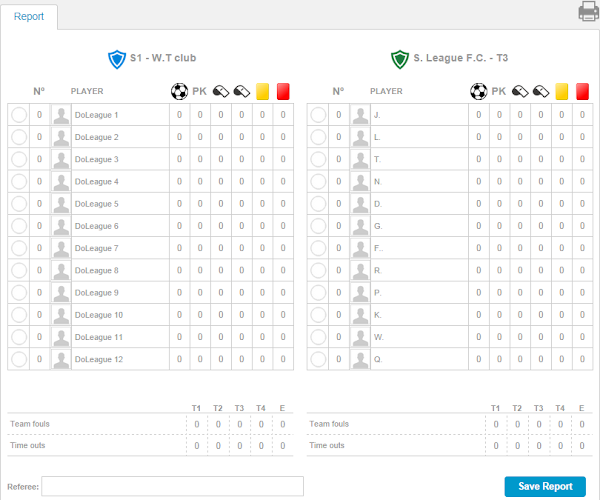 Recognizable symbols, such as cards or goals, are incorporated into this new section and we get that your matches reports be more personalized leaving your choice to put the icon of each team next to your information. You can print directly each report for have a hard copy and also will be saved for future reference. Great, right ?. Today you can see the new match reports of all your tournaments in DoLeague. Not expect more to customize them!